A zoo is never finished. The staff at Hellabrunn are always looking for ways to constantly improve the facilities – for both animals and visitors. Our ongoing work includes maintenance and regularly improvements to the enclosures. Sometimes an enclosure requires major repairs or a complete renovation. The objective of all construction work is to enhance the living conditions for the zoo's residents and at the same time ensure that you enjoy your visit to Hellabrunn. The next time you visit the zoo we hope you will be able to notice some of the improvements made and enjoy the benefits they were designed to provide. 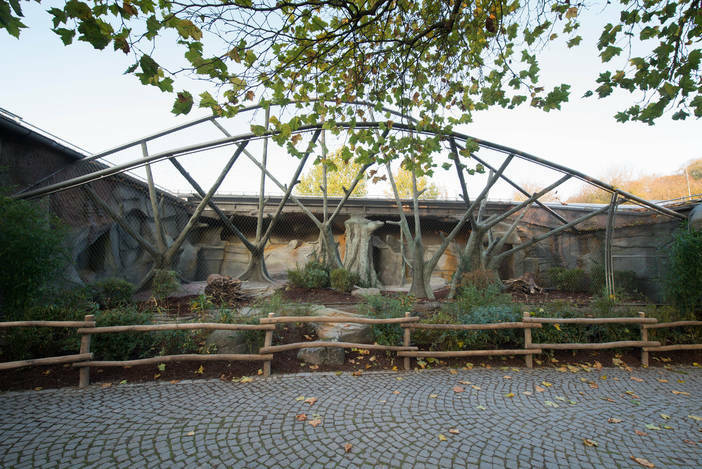 The drill group at Hellabrunn Zoo are enjoying the benefits of a newly renovated enclosure received in October 2014. The renovation, designed to meet the needs of this endangered primate species, includes natural-looking rock cladding, climbing facilities, numerous plants and even a stream. The African Giraffe Savannah at Hellabrunn Zoo opened in May 2013 after a short construction period of just one year. The 10,000 m² enclosure is home to the male giraffe Togo, the female giraffes Bahati and Kabonga and the boy giraffe Naledi. 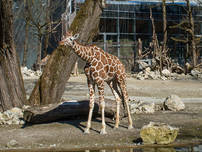 The giraffes are enjoying their new home situated close to the Isar entrance. 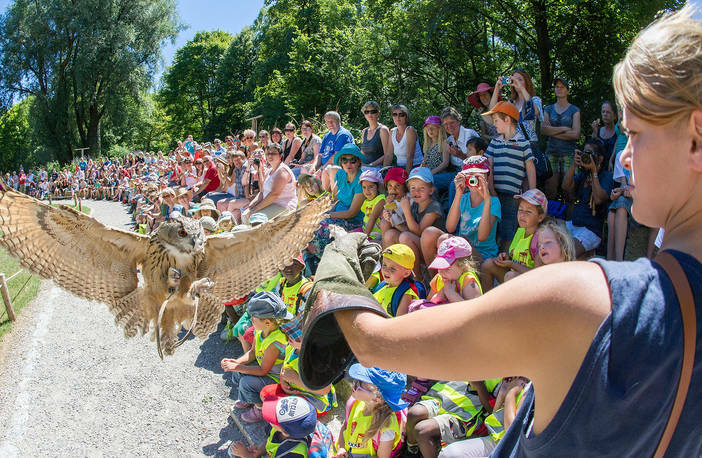 The birds of prey show at Hellabrunn Zoo moved to a proper bird arena in spring 2013. Since then visitors have been able to sit in comfort in the stands and admire the flying skills of our feathered stars. At the start of the season 2011, Hellabrunn Zoo opened an outdoor enclosure exclusively for Humboldt penguins. The new enclosure features more than of 200 m² rocky landscape, a waterfall, over 60 plants and 18 nesting areas provide the perfect enviornment for the penguins. 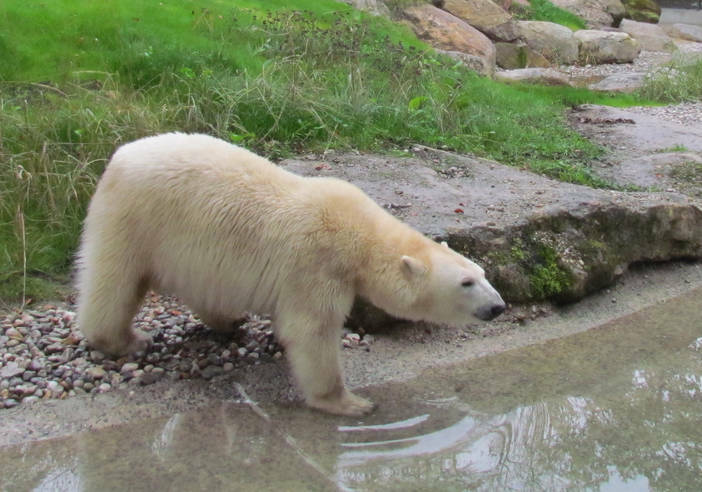 Hellabrunn's polar bear enclosure is one of the most forward-thinking polar bear enclosures in Europe. The enclosure covers an area of 2,800 m² and features an underwater viewing tunnel with spectacular views of the pool from below. You can watch the white bears swimming above your head through large panoramic glass.